Alumnus Yunteng Huang (right) visits with his doctoral advisor, Professor Gabor Temes. Yunteng Huang’s career in electrical engineering was a natural progression from growing up playing in his father’s electronics repair shop. From toy cars made out of wire spools to walkie-talkies, Huang and his brothers got experience building things on their own from an early age. But Huang also watched his father closely. “I witnessed how he continued to improve devices over time. And I saw how curiosity and exploration paid off in the end,” Huang said. 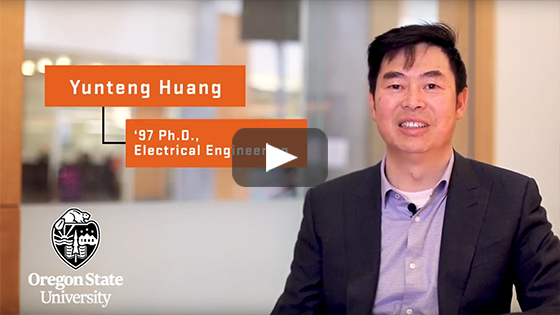 When Huang picked electric engineering as his major in college, his father wasn’t sure it was the right path. Rather than follow in his footsteps, he hoped Huang would become a doctor or scientist. “Recently, I told him, ‘I think it turned out OK,’” said Huang, who has twice been honored by Oregon State’s College of Engineering for his contributions to the field. 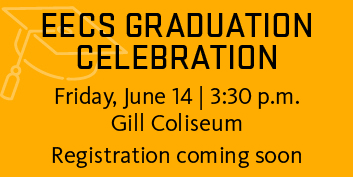 In February, he was inducted into the college’s Academy of Distinguished Engineers, and in 2011, he was elected to the Council of Outstanding Early Career Engineers. After receiving his bachelor’s degree in electrical engineering from Shanghai Jiao Tong University, Huang applied to Oregon State on the recommendation of a friend who was already there in graduate school. Like his friend, Huang ended up working with Gabor Temes, professor of electrical and computer engineering and a legend in the area of analog integrated circuits. Yunteng Huang ('97 Ph.D., Electrical Engineering) was advised by Gabor Temes, professor of electrical and computer engineering at Oregon State University. Huang's career has spanned working for a startup, managing at Silicon Labs, and starting his own companies. His new company is Aeonsemi Inc. Even now, when Huang sees Temes, he is inspired by the enthusiasm of his mentor. He tells of a time at a recent conference when Temes became so animated about a new circuit design that he sketched it out on a napkin. Huang says the foundation he got at Oregon State supports his career, which has spanned working for a startup, managing a large group, and starting his own business. When he graduated with his doctorate, Huang had many job offers, but chose a small startup called NewPort Communications, which was developing high-speed network communication chips. As NewPort’s first employee, he had the opportunity to learn skills beyond circuit design. He also talked to customers and worked on product design. “In a small company I had the opportunity to have a huge impact,” he said. NewPort was eventually acquired by Broadcom Corp. to become its important networking business unit. Huang discovered he also had an entrepreneurial spirit that continues to drive his career today. “I enjoy creating things from the ground up. And I’m comfortable with uncertainties,” he said. Silicon Labs was a startup when he began working there in 1998. He helped the company develop two new businesses that have product lines worth millions. In 2006, he left Silicon Labs to co-found a business in China to design a smart chip that can remotely read utility meters. Two years later, he was back with Silicon Labs when they acquired his company and hired him to lead a team of engineers to integrate and expand the technology. Huang says small companies are better at driving innovation. So, in 2018, he left Silicon Labs to co-found a company called Aeonsemi Inc. to develop high-end chips for network communication. “We are tackling some of the hardest problems for modern computing to meet the increasing demand of data rate for everyone.” Huang said. Throughout his career, Huang says, the biggest challenge has been maintaining a work-life balance and staying connected with his family when he has to work long days and travel for business. He appreciates all the support his family has given him to be able to pursue his career. Although his sons did not exactly follow his footsteps, they are both in engineering: one in computer science, and the other in environmental engineering. It’s too early to tell if his 10-year-old daughter will take an interest in engineering, but he says that he is happy with whatever his children do as long as they are following their passion. It’s the same advice he gives students. “If you like something, just go for it and eventually everything is going to work out just right for you,” Huang said.